Last Friday, after what seemed to be the longest wait ever, I finally got my copy of the 13th issue of EON. You figure that Europe must be moving away from North America, because it takes less time to travel to the moon and back, then it does to ship a magazine across the Atlantic! But anyways, enough of my whining! This latest is full of great articles, chronicles and more. The Insider's Guide on Factional Warfare, the economy and cartography are brilliant pieces. 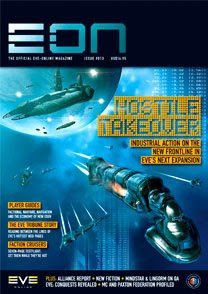 There's also tidbits of information on the EVE RPG and board game (Conquest), EVE Tribune and of course the main article on Quantum Rise, the next expansion. I have yet read the chronicles, which returned in this issue - The High Garden and Before - but I promised to let you know my thoughts once I have. I can't wait for the special "EON Chronicles" issue to come out. EVE Fiction FTW!! Let me leave you with this: the EVE Fanfest is just shy of 14 days from now - that's two weeks people! I can't wait!! I'm looking forward to it though. I've never actually flown the navy issue cruisers, curious about them. Woa!! Just don't go postal! !